Last night Sarah and I came to the agreement on my suggestion that I would be taking over the blog every other day. I have been posting infrequently due to the fact that Sarah always seems to take care of the biographical work. I figured that for me to go on and write up the same thing from my own perspective wouldn’t be that interesting. So I had to try to come up with something a bit more off topic or interesting in its own right. I still plan on doing that but also taking part in the biographical work as well. So here goes. Last night Sarah went off to a bar with another CSer and I stayed in and worked on my bike and did some reading. Passed out sometime after 10 pm and didn’t move again till 7 am. After the alarm went off I took a quick shower and set to making a quick breakfast and start packing. 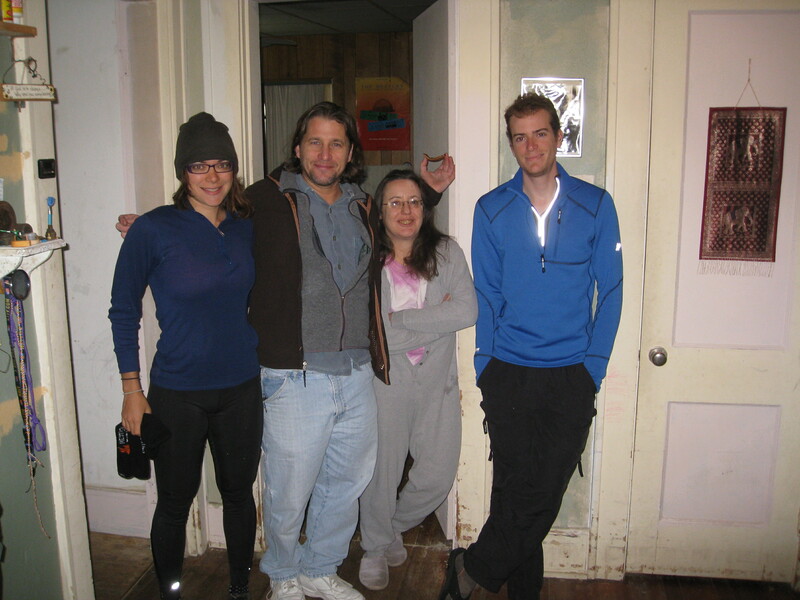 Mat and Chevaun were up and we had a great chat about the area and the way into Picayune. Sarah got out of bed round 8:15-8:30 and headed into the kitchen. I sat down and started packing up my gear and had everything ready to go before 9 am. We then took a quick picture with Mat and Chevaun. Mat and I set to working on the bikes a bit. 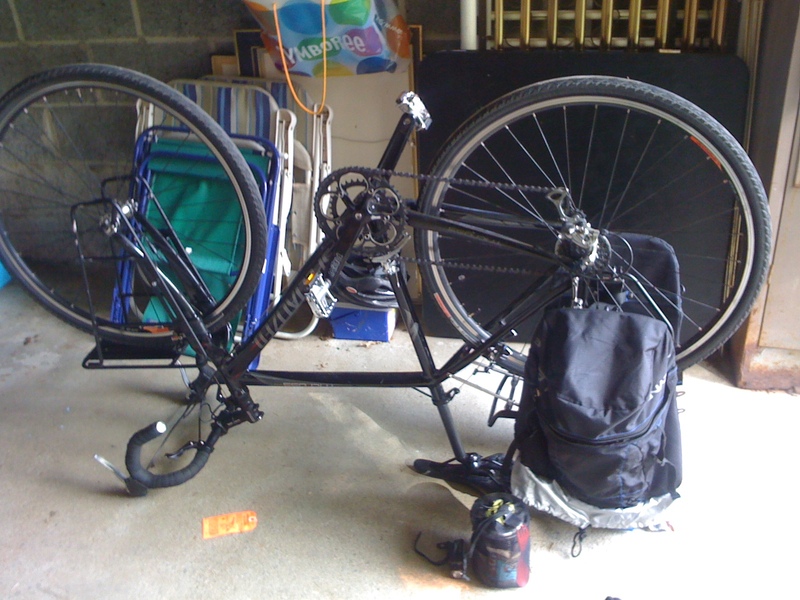 Checked the tires and gears, added a bit of air to everyone’s tires and loaded up my bike while Sarah finished packing. We were set and ready to leave the house around 9:30. I had a really good time with Mat and Chevaun. Mat has a good wealth of knowledge on a great many subjects. He was kind enough to take some time to teach me how to weave a basket out of willow. I always enjoy learning new skills and I intend to put this one to good use in the coming years of travel. Chevaun was very generous, caring and a great cook. I look forward to seeing them again sometime in Nola, perhaps around Mardi Gras if not sooner. Shortly after departing we made way to a local market to pick up some snacks for the day and to get Sarah a good breakfast. Sadly the market did not have any prepared food so we settled with snacks and took off for route 11 south. It was a cold morning which I greatly appreciated. The heat and humidity has not been particularly pleasant and the crisp coolness of the morning actually felt like northern winter air. Sarah did not share my sunny disposition in regards to the weather and seemed to suffer greatly from the cold. After 6 miles on the road we stopped at small rest stop that had coffee and a subway so that Sarah could get something to eat and a warm drink. After she finished her coffee we set off once again. This first 35 miles of the day was constant rolling hills. This was another one of the rare days where I consistently held the lead on Sarah. It seems that the cold and lack of a good breakfast took a harsh toll on her morale and spirit. I also think that I am better at hills than her as I always tend to make ground on her if not pass her on them. It may be that I just push harder on the hills or that I may have more strength but less stamina as she easily overtakes me on flat terrain. We took our first real break of the day around 11:35 at 27 miles. Sarah changed out of her damp sweaty clothing for a dry set and laid everything out in the sun. We dug into our food quickly. To my great chagrin Sarah informed me that she had forgotten what was left of our honey at Mat and Chevaun’s. It was really good honey. I shall have to find more of it in New Orleans. We set off again after twenty minuets. We have been on route 11 for the past few days of travel and while it has not been the best road safety wise I can not really complain. The narrow shoulders, if they are there at all for the past 150 miles has been cause for slight concern. However all but a small minority of drivers have been very courteous to us and often give us a wide berth when passing us so I really have only praise for Mississippi drivers, Go you guys! I did get one honk on the road today. This brings up one serious problem with cars in the world. There is no clear or uniform way to communicate between vehicles or to pedestrians and cyclists. Usually when someone honks at us we have no way to interpret what they are trying to express unless we are able to see their face (or gestures), like smiling and waving, or shouting and furious gestures. So when someone honks and they pass far to fast to see I like to think that they are supporting us or wishing us well. Its much more useful than to get negative. We need some sort of simplified Morse Code for honks that should be taught in all drivers ed courses, seriously. Sarah caught up to me around mile 52 and we took our second break. Had a quick snack and took off on the last 11.3 miles of the day. We arrived at the Picayune First United Methodist Church. So far the Methodists have been extremely kind to Sarah and I on this trip and the congregation of Picayune was no exception. I spoke briefly to the secretary who directed us to the exercise center to find the Minister. We were welcomed into the center by Brother Jim. After quickly explaining our mission and situation he very warmly told us he was happy to have us there and that he would find us a place to stay. While he made a few phone calls on our behalf we began recounting the tale of our travels. After a short period Brother Jim had found a wonderful place for us to stay. We followed him and another very kind man ( I think overheard his name as Ray) to his truck. We loaded up the bikes and they drove us over to Barbra’s house. On the way we discussed (Rays?) facilitating work as an Aerospace engineer. He and I also briefly discussed the fact that he was working on his masters in medieval history. Its not very frequently that one meets a historian let alone one involved in my area of study. I would have loved to have more time to speak with him. We arrived at Barbra’s and after they helped us to unload the bikes we were welcomed inside to smiling faces and a cacophony of barking. We were introduced to Barbra and Chris who live in a beautiful house with a great many animals, dogs first and foremost and numerous farm animals. After a quick chat Brother Jim and (Ray?) left to get home and to work. We talked about a number of things before being shown to our room to unpack a bit and shower. After showering we had a great dinner of pasta and chicken pot pie with pecan pie and ice cream with a cup of tea to finish it off. We talked for a while before the subject of New Orleans came up and what our plans were. On learning that we had no real idea of where we were going to live for the brief time we would be in Nola Barbra pulled out her address book and called up a pair of friends who have an apartment in Nola. We chatted briefly about what we were doing and our plans and arranged to call them to visit the apartment whenever we were ready. Shortly after the phone call Chris retired and Barbra Followed shortly after. I honestly can not fully express my gratitude for all the generosity that I have received on this trip. It really means so much to me to be so warmly received by so many kind strangers. I hope that one day I will be able to return all of the kindness that has been given me on this trip. Now I lay in bed composing this post and I do believe that this will do it ladies and gentlemen. Have a good evening everyone and thanks for following us and being part of this awesome if not crazy adventure! Well its Black Friday and the 2011 shopping season is here. I thought I would review a number of items that we have with us on the trip. After over 1600 miles I have a good feel for our gear. Hopefully this will be of some help to anyone planning their own bike touring trip. This bike has so far worked out great for me. Its a 54 cm aluminum frame with a carbon fork. 700 rims. Shimano 105 components. This bike is light, strong and provides a comfortable ride on road and thanks to its design it handles fabulously off road. It has tapped holes for both the front and rear racks. As long as you balance the weight it handles fabulously and I have not had a single problem with any of the components. The only change I would make to my set up is the gearing. It is a cyclocross bike so it’s geared rather aggressively, this can make for some tough uphill days so I plan on changing out the crank before heading to Europe. Some people tend to go for full steel frames when touring. In general this tends to be a good call for long tours through remote areas as steel is a very easy material to repair. Secondly steel can provide a smoother ride than other materials. So far I am very happy about my choice and suggest giving one a ride at the local Specialized Rep.
One word of caution. Every model before the 2011 model has the tapped holes for the front rack, they eliminated these in the 2011 model. They realized afterward that the taps were in demand and brought it back for the 2012 model. Just keep that in mind. Surly Front and Rear Racks. I did a large amount of reading before settling on my bike racks. I am very happy with the Surly rack. 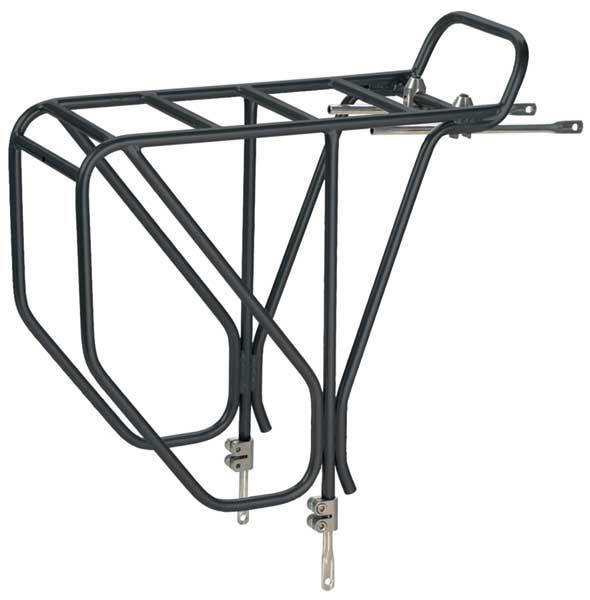 The front rack is rated to 70 lbs and the rear 80 lbs. I currently have the rear rack on my bike and a different one of the front. The rear rack has held up wonderfully, structurally and cosmetically. While my front rack is still structurally sound it has not held up cosmetically and large areas of the paint have chipped off resulting in rust. I have had to clean this off several times. I will be holding on to my front rack until there is a structural failure. At that point I will be replacing it with Surly, no doubt about it. This here is the Ortlieb Roller Classic. 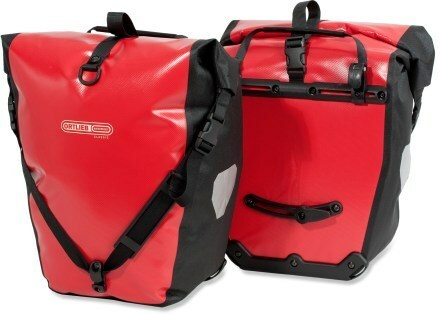 If you do any reading on the thousands of websites reviewing what panniers to use the Ortlieb company comes up again and again as the best choice. I now cast my vote with those who have come before, Ortlieb is the best! For long tours the Roller Plus or classic seem to be the best way to go. The most important feature in any storage bag for any trip is durability and waterproofing and these bags pass with flying colors. I have been through driving rain, light hail, crashes both on and off road and been hit by a bus. These have suffered zero structural damage and maintained their waterproofing. There are a few cosmetic marks from soot and dirt but a bit of soap solves this problem quickly. The attachment system is simple and convenient. 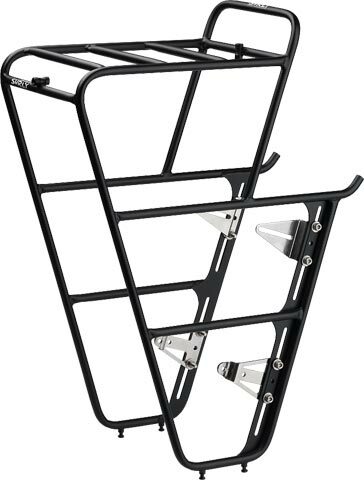 It can be quickly adjusted to easily fit most any bike rack. Not only are they simple to put on and take off but they are also very convenient to carry around as they provide a shoulder sling for the bags. I greatly enjoy backpacking and camping so I spent a long time picking the tent for this trip. 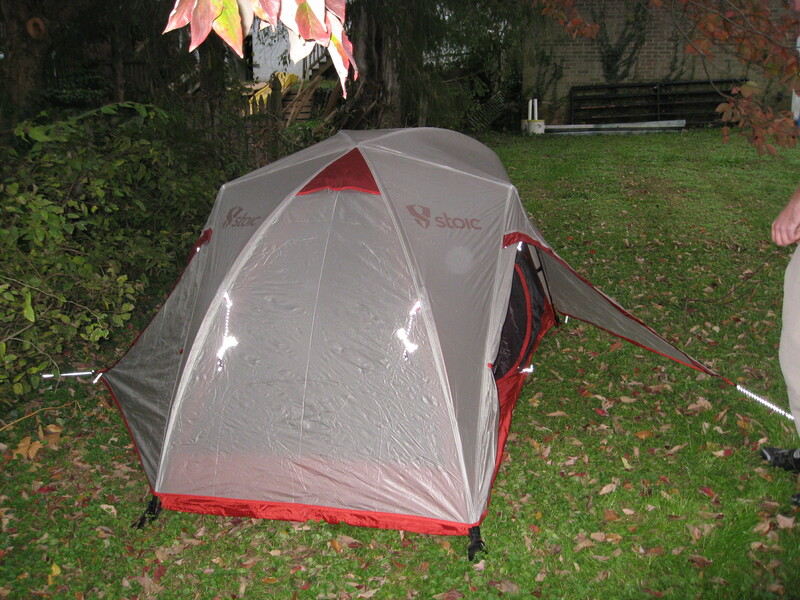 In the end I settled on the Stoic Arx XL 2 tent for several reasons. First of all its a fairly light tent, with everything packed it weighs a total of 4lbs 11 oz. It sets up quick and easy and breaks down just as fast. The only real downside is that it does not come with a footprint which I would suggest getting. While this tent has proven to be wonderful we have not had to use it on this trip due to the overwhelming generosity of the CouchSurfing and WarmShowers communities. The people over at Mountain Hardware make excellent gear for nearly every situation. I personally have three of their products with me along for this trip. The Pac-lite shell, the Micro Grid zip tee Fleece and the Micro Power Stretch zip tee Base Layer . Each of these products have functioned perfectly and I have been through some pretty rough weather so far. In addition to great performance the company stands behind their products and work with any complaints very quickly and often will outright replace the product if they are unable to repair it. I have had a great relationship with Mountain Hardware and encourage anyone undertaking any sort of expedition to use them. This is a great company from New Zealand. They specialize in Merino wool products and they are all amazing. I have two of their GT200 Chase shirts and they are amazing. The wool is soft, very warm wicks sweat and moisture away and is antimicrobial so for those trips where you haven’t seen running water for days and thus no bathing, these shirts don’t smell.Another interesting thing about the site is that there is a code associated with every garment and you can put that into the website and track precisely where the wool came from. I strongly suggest any of IceBreakers clothing for warmth, comfort and adventure. I have two pairs of their bike shorts and a fabulous wind breaker. They have all served me fabulously over the course of 1600 miles. There are tons of reviews and sites on how to pick a pair of bike shorts. I am not going to get into it, go find those sites and read them. In the end though pearl iZumi makes a good pair. As for the windbreaker its fabulous. It packs down to the size of a soda can, its highly florescent and can be seen from several hundred meters and keeps off wind and light rain. Again Pearl iZumi, good stuff. Well thats the short version. More reviews and other thoughts to follow. Thanks, cheers everyone. This trip has been a great adventure so far. For the most part it has not been the land passed or the sights seen, its the people I’ve meet. All of you whom I have both stayed with and met on the road. You are who has made this the wonderful trip that it has been so far and that I am sure it will continue to be. Unfortunately the media tends not to report on the general good that goes on in the world the kindness that seems overwhelming on the small scale, yet when it is repeated again and again as it has been on this trip it shows itself to be the norm. The norm that is ignored. The media only wants the sensational. That which tends to be sensational seems to be cruelty and violence, but for those who are reading this I can only say good things of the world. In the 24 short years that I have been around I have been fortunate to experience very little but kindness and sincerity from all of those around me. In short I want thank everyone who has helped me so far up to this point, both on the road and in general. All I can really hope for is that I can return the kindness in the same or greater proportion than what has been done to me so far. This ride, is a small expression of that will to help others. Thank you everyone who has been a part of it so far.